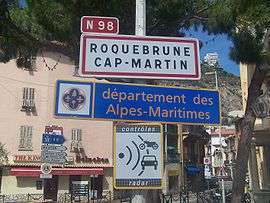 Sign welcoming visitors to Alpes-Maritimes. Alpes-Maritimes (French pronunciation: ​[alp.ma.ʁi.tim]; Occitan: Aups Maritims; Italian: Alpi Marittime) is a department of the Provence-Alpes-Côte d'Azur region in the extreme southeast corner of France. The inhabitants of the department are called Maralpins, but are usually referred to as Azuréens (inhabitants of the Côte d'Azur). Belvédère in the Vesubie valley, one of the many villages perched in the Alpes-Maritime. 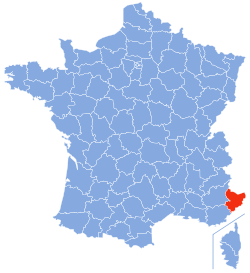 The Alpes-Maritimes department is surrounded by the departments of Var in the southwest, Alpes-de-Haute-Provence in the north-west, Italy, and the Mediterranean Sea to the south. It surrounds the Principality of Monaco on the west, north, and east. Its topography is very mixed. As its name suggests, most of the department is a constituent part of the overall topographic Alps - including the Maritime Alps - but it also has the distinction of being a coastal district with its Mediterranean coast. The coastal area, urbanized and densely populated (shaded in red on the map), includes all the cities in an almost continuous conurbation from Cannes to Menton, while the larger but sparsely populated mountainous area (light green) is fully rural with the exception of the three large resorts of Valberg (created in 1936), Auron (created in 1937), and Isola 2000 (created in 1971). The highest point of the department is the Cime du Gélas (3143 m) on the Franco-Italian border which dominates the Vallée des Merveilles further east. In fact the summit of Monte Argentera is certainly higher at 3297 m above sea level but it is located in Italian territory. There is also Mount Mounier (2817 m) which dominates the south of the vast Dôme de Barrot which is formed of a mass of more than 900 m thick red mudstones deeply indented by the gorges of Daluis and Cians. Except in winter, four passes allow passage to the north of the Mercantour/Argentera mountain range whose imposing 62 km long barrier covered in winter snow which is visible from the coast. From the west the Route des Grandes Alpes enters the Cayolle Pass (2326 m) first on the way to the Alps and the sources of the Var in the commune of Entraunes. Then the route follows the Col de la Bonette - the highest pass in Europe at 2715 m - to connect to the valley of the Tinée then the Ubaye. Further east, the Lombard pass (2350 m) above Isola 2000 allows access to the shrine of Saint-Anne de Vinadio in Italy. Finally, at its eastern end, the Col de Tende (1871 m) links with Cuneo in Italy. Department map showing its division into the 2 arrondissements and the location of some of its principal cities and towns. In 1860 Camillo Benso, Count of Cavour, one of the architects of Italian unity with the kingdom of Piedmont-Sardinia, negotiated support for Napoleon III in exchange for Savoy and the County of Nice. The annexation was confirmed on 15 and 16 April 1860 by 30,712 male electors enrolled in the 89 communes of the County of Nice who, for the first time, had universal male suffrage by plebiscite. The "Yes" vote for reunification with France was 83.8% of registered voters and 99.2% of votes. The new department of Alpes-Maritimes consisted of the former County of Nice, divided into an Arrondissement of Nice and an Arrondissement of Puget-Théniers (both arrondissements existed in the former Department (1793-1814)), and a portion of the Var department which formed the Arrondissement of Grasse. 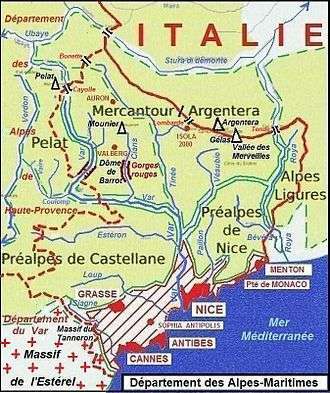 However, the County of Nice did not include Tende and La Brigue which were incorporated into France in the Treaty of Paris in 1947. Alpes-Maritimes benefit from the installation at Menton since October 2005 - the first stage of Sciences Po - which is dedicated to the relationship between the northern and southern shores of the Mediterranean and the relationship of Europe with the Middle East. Since the Second World War, the department has voted to the right. The nine electoral districts of Alpes-Maritimes are all currently held by the right (eight UMP and one NC). Of the five senators representing the department, four are right and one is socialist left. Of the fifty-two general councilors, forty-two are right and ten are left or relatively left. Alpes-Maritimes has experienced problems of corruption in its politicians in the 1980s and 1990s which led to criminal convictions including the mayors of Nice (Jacques Médecin), Cannes (Michel Mouillot), and Antibes (Pierre Merli). The President of the General Council is Éric Ciotti of the Union for a Popular Movement (UMP). The UMP's majority on the general council is one of the largest majorities in any such institution in France. The General Council has charged 1 euro per vehicle journey in the department, regardless of distance, since 1 January 2008. The presence of the Mediterranean Sea and the Alps under a mild sky has favoured one dominant activity: tourism which accounts for 64,000 jobs directly in the Alpes-Maritimes. For only the city of Nice the tourism turnover represents a 12 to 13% share of the whole tourism market in France. The capital of the French Riviera is the sixth most populous city in France. The city of Nice also has the second largest airport in France (Nice Côte d'Azur Airport) after Paris and its three airports at Roissy, Orly, and Le Bourget. There are nearly 10.5 million passengers per year passing through Nice Airport (2011 data). The area inland from the busy Côte d'Azur is an excellent base for many outdoor sports: cycling, mountain biking, skiing, walking, rock climbing, canyoning, canoeing, rafting, fishing, horse riding, Adventure parks, caving and the area has the first ever underground via ferrata. The area has internationally renowned paragliding and hang gliding flying sites at Col-de-Bleyne, Gourdon, Gréolières, and Lachens. ↑ Legal Populations 2009, INSEE. Consulted on 14 July 2012.